Give that baby a delivery job! An adorable page boy 'stole the show' at a wedding in Monaghan, when he tore up the aisle in his chic automatic looking like a mini James Bond. After an initial false start, six-month-old Darragh McElroy eventually shot up the aisle to his uncle, groom Chris McQuaid, aided by his daddy on controls. Bride Shauna explains that the idea came about after much deliberation about how to get little Darragh up the aisle in Latton, Co. Monaghan, for his aunty and uncle's wedding on Saturday. "We were all thinking of ideas because he's only six months," newlywed Shauna told THEVOW.ie, "so we were saying 'well what can we put him into?'" "His daddy is a carpenter and he was initially going to make something for him, but then we thought of the car and when we got it he was just so happy in it. It was perfect!" 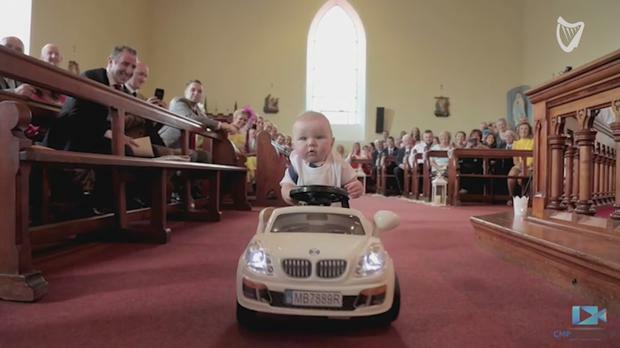 Darragh's dad controlled the car from the pews, while his uncle waited at the top of the aisle. Little Darragh was then followed in by two older page boys, Alfie and Harry, flower girl Ellie May, two bridesmaids and two groomsmen. "It was complete surprise to everyone," says videorgrapher Conor Conlon of CMP Productions, "the wee car was kept hidden until the last minute but there were lots of smiling faces when the guests eventually spotted him on the aisle. Happily wed Shauna and Chris were delighted at how the ceremony - and later the reception in the nearby Errigal Hotel - turned out, and although Shauna 'can't believe' it's all over, the couple are now looking forward to their honeymoon in Dubai and Thailand (and Darragh is likely looking forward to his career as a stunt driver in Jason Bourne: 2038).